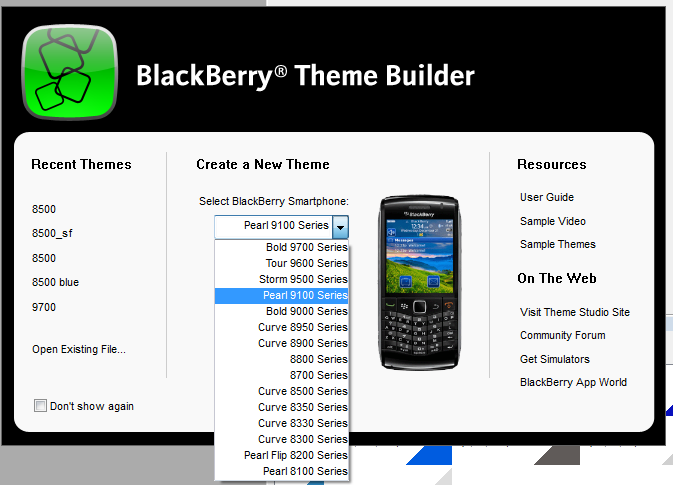 BlackBerry Theme Builder SP1 Released; Now Supports Pearl 9100 / 9105, Bold 9650, Curve 8910 and 8950?! Do you have one of the new BlackBerry Pearl 3G’s, Bold 9650, or Curve 8910, and went to buy an app you thought was for your device, but in fact wasn’t? Luckily, this problem should soon be solved with the release of the BlackBerry Theme Builder service pack 1. Before, theme developers could not design themes for those three new devices. For some reason when the users of these devices would check out the available themes for purchase or download via App World, incompatible themes would appear. You can imagine the frustration a person might have felt when they bought a $5 dollar premium theme, only to find out they couldn’t use it nor get a refund. Hopefully developers can start pumping out new themes that will work and App World can correct the filter with App World 2.0! One thing that struck us as being strange was the inclusion of a Curve 8950. We haven’t heard anything about this device, but think it could be the Atlas with a trackpad. You may recall seeing China Mobile receiving the 8910 with a trackball and hearing rumors of an 8980. Perhaps the other Atlas device we’ve seen is an 8950? Or could it just be a spelling error since the Bold 9650 isn’t listed, which it should be. What do you think the 8950 could be? If you’re a developer, download Theme Builder SP1 here.